A new interpretation of the 2010 election results. Why did the Democrats decisively lose this election? It’s not really a mystery. The 2010 midterms were shaped by three fundamental factors: the poor state of the economy, the abnormally conservative composition of the midterm electorate, and the large number of vulnerable seats in conservative-leaning areas. These trends cost the Democrats their House majority but were not strong enough to sweep them out in the Senate. What’s interesting is who voted for the Republicans and why. Independent voters, white working-class voters, seniors, and men broke heavily against the Democrats due to the economy. Turnout levels were also unusually low among young and minority voters and unusually high among groups that lear right, contributing to a midterm electorate that was extremely favorable to Republican candidates. But while the election was a serious rebuke to the Democrats and the political status quo, it was not necessarily an endorsement of a conservative agenda. Here’s a rundown. Age: The 2010 electorate was noticeably light on young voters, who have recently been a very good group for Democrats. About 11 percent of 2010 voters were 18-29 years of age, sharply down from their 18 percent share in 2008 and also down from their 13 percent share in 2006. The last time the proportion of young voters dropped this much between a presidential and congressional election was between 1992 and 1994. Young people ages 18 to 29 years old supported Democrats by a 17-point margin in the 2010 election (57 percent to 40 percent). This is a significant drop from their 63 percent / 34 percent support for congressional Democrats in 2008, though closer to their 60 percent / 38 percent support in 2006. In contrast with youth, seniors’ turnout was staggering. They were 23 percent of 2010 voters, up sharply from their 16 percent share in 2008 and their 19 percent share in 2006. Even more unusual was their very strong support for congressional Republicans, by 59 to 38 percent. That's compared to a one-point margin for the Democrats in 2008 and a one-point margin for the GOP in 2006. Indeed, there is nothing even close to this election's 21-point Republican margin among seniors going all the way back to 1988. 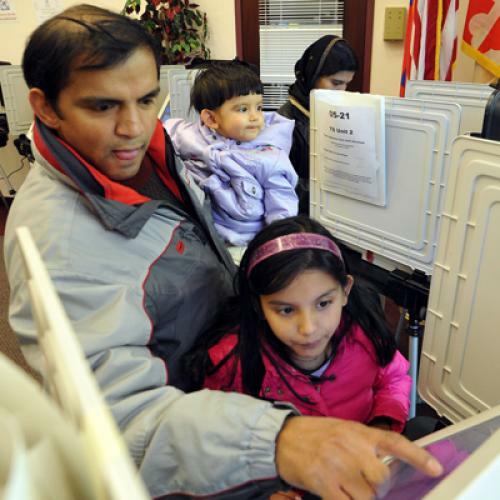 Minorities: Voters in 2010 were 78 percent white and 22 percent minority. The minority figure represents a decline of four percentage points from the 2008 level of 26 percent. This is a sharp drop by recent standards. The years since 1992 have typically seen either a slight increase or drop in the minority percentage between a presidential and a congressional election. Even when there was a drop in the minority percentage between 2004 and 2006, it was only half as large as the drop between 2008 and 2010. Congressional Democrats carried Hispanics 64-34 percent in 2010, not far off their 68-29 percent performance in 2008 and their 69-30 percent showing in 2006. Black voters were even stronger for Democrats—90-9 percent—which is in line with their votes of 93-5 percent in 2008 and 89-10 percent in 2006. White Voters: White voters were a different story. They supported congressional Republicans by 60-37 percent. This 23-point margin compares to an eight-point margin for congressional Republicans in 2008 and a four-point margin in 2006. The 23-point margin among whites is also higher than it was in two other very good Republican congressional years: 19 points in 2002 and 16 points in 1994. And the 60 percent share of the white vote is higher than that attained in either one of these years—or in any other recent year. It is worth noting that, while this 60 percent share of the white vote sufficed for a thumping victory in 2010, it will probably not be adequate for any kind of a victory in 2012, given trend assumptions about minority turnout and Democratic support. The GOP will probably need at least 61 percent of the white vote to eke out the narrowest of victories in that electoral universe. So the bar just gets higher as time goes on. The most significant shift against the Democrats occurred among the white working class—defined here as whites without a four year college degree. Congressional Democrats lost this group by 10 points in both 2006 and 2008. Yet this deficit ballooned to 29 points in 2010—a deficit even larger than 22 point margin Democrats suffered in 1994. That created an awfully big hole for Democrats to crawl out of, especially given relatively depressed turnout among Democratic-leaning constituencies. Democrats also suffered losses among white college graduates, which, unlike the white working class, is growing as a share of voters. Congressional Democrats split this group evenly in 2006, and they lost them by six points in 2008. But that deficit increased to 18 points in 2010. Gender: Democrats lost women by a single point in 2010 and men by 14 points. That 14-point deficit among men represents a 20-point margin swing among men relative to 2008, when Democrats had a 6-point advantage and a 17-point swing relative to 2006. The margin swings among women were slightly less: 15 points relative to 2008 and 13 points relative to 2006. Independents: There was a sharp swing among independents toward the Republicans in 2010. The GOP carried this group by 18 points, 56-38 percent. That compares to an eight-point Democratic win among independents in 2008 and an 18-point advantage in 2006. This is by far the GOP’s best performance among this group since 1994, when they carried them by 14 points. Of course, it is possible that a substantial part of 2010’s shift is due to a higher turnout of conservative independents relative to moderate and liberal independents, or to a larger presence in the voting pool of independents who prior to 2006 would have identified themselves as Republicans, but were turned off by George W. Bush’s performance in his second term. But we lack data at this point to evaluate these possibilities. Ideology: This election, 41 percent of voters said they were conservatives. That’s quite a bit higher than in recent elections. Only 34 percent of voters said they were conservatives in 2008, and just 32 percent in 2006. Even in 1994, only 37 percent of voters were conservatives. The high conservative turnout came at the expense of moderates. The moderate group was actually smaller than conservatives as a proportion of voters in 2010—39 percent compared to 41 percent. By comparison, moderates were 44 percent of voters in 2008, and they were 47 percent of voters in 2006. And in the 1988-2004 period, the percent of moderates never dropped below 45 percent. Not only were conservatives an unusually large part of the electorate in 2010, but they also voted unusually heavily for the GOP by 84 percent to 14 percent. This margin is substantially higher than the GOP has attained in any election going back to 1988. Even in 1994, they carried conservatives by “only” 81 percent to 19 percent. Moderates supported Democrats this year by 55 percent to 42 percent. By contrast, they backed Democrats 61 percent to 37 percent in 2008 and by 60 percent to 38 percent in 2006. Yet the 2010 margin among moderates is very similar to that attained by congressional Democrats in elections prior to 2006 going back into the 1990s. In sum, this cycle saw a substantially older, whiter, and more conservative electorate than in 2008. This in and of itself explains a good deal of what happened in 2010. Voters in 2010 also said that they split their vote evenly between Obama and McCain in 2008 (45 to 45 percent), meaning that McCain voters were therefore strongly overrepresented in the 2010 electorate. Indeed, President Obama might not have been elected if only 2010 voters had voted in the 2008 election. The clearest message from the exit polls is that voters backed the GOP because of the economy. More than three-fifths (62 percent) selected the economy as the most important issue facing the country today and Republicans received 54 percent to 44 percent support among that group. Half of voters said they were “very worried” about economic conditions, and these Americans voted Republican by 70 percent to 28 percent. Similarly, 41 percent of voters said their family financial situation was worse than two years ago, and this group voted Republican by 63 percent to 34 percent. And 37 percent described the state of the national economy as “poor,” and these voters supported the GOP by 71 percent to 26 percent. More voters (35 percent) blamed Wall Street for today’s economic problems rather than President Bush (29 percent) or President Obama (23 percent). But these Wall Street-blaming voters supported Republicans by 56-42 percent. The Obama administration’s association with bailing out Wall Street bankers, who are heavily blamed for the bad economy, apparently had a negative effect on Democratic performance in this election. The election did not appear to be a repudiation of the new health care reform law. About as many said they wanted to see it remain as is or be expanded (47 percent) as said they wanted it repealed (48 percent). Nor did it appear that voters were embracing the GOP position on tax cuts. A 52-percent majority of voters wanted to either keep only the Bush tax cuts for those under $250,000 or let them all expire compared to 39 percent who wanted to keep all the tax cuts. Political commentators are notoriously prone to over-interpreting election results. Strategic and policy decisions certainly made some difference in the magnitude of losses, but in a horrible economy it’s difficult to escape the reality that Democrats were poised to lose a significant number of seats no matter what they did. Ruy Teixeira and John Halpin are senior fellows at the American Progress Action Fund. This article is adapted from a study they produced at the Center for American Progress.